High Visibility Waterproof Padded Coats! A glowing addition to the Outhwaites Range of quality coats. This new 'Day-Glow' coat is Waterproof, Windproof and Washable. 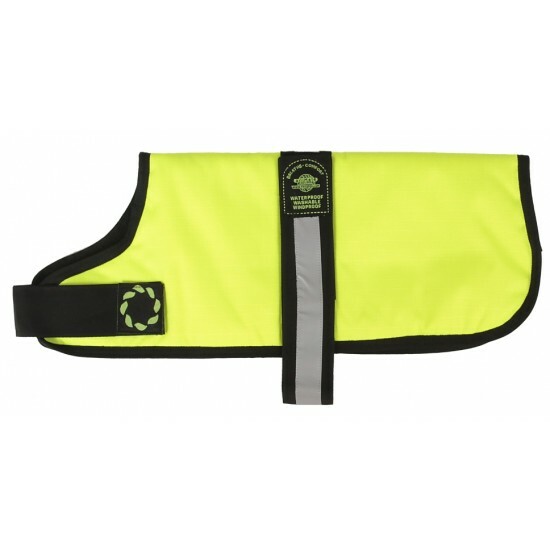 This coat will provide your pet with high visibility during the winter months. This attractive Hi-Tech fabric is specially treated to give a high moisture permeability combined with a padded and cosy feel that makes it comfortable to wear. These woven polyester coats are designed for durability and comfort with sizes to suit most dogs. They are made with two underbelly straps from 20" upwards.